Attention! Many social networks are domain www and without www, as different domains, so we recommend to decide on this matter in advance and set the preferred domain, as well as set up redirects to avoid further problems. All settings of social networks are carried out through plug-ins. Settings can be found, Manager of extensions => Manager of plug-ins => group of plug-ins "slogin_auth". Beforehand it is required to set up a plug-in. 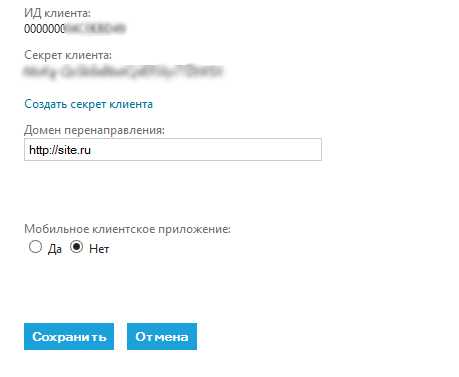 Manager of extensions => Manager of plug-ins => group of plug-ins "slogin_auth" => plug-in "Social Login Vkontakte auth". Go here and create new application. Choose Web-Site, enter name, site address and base domain. 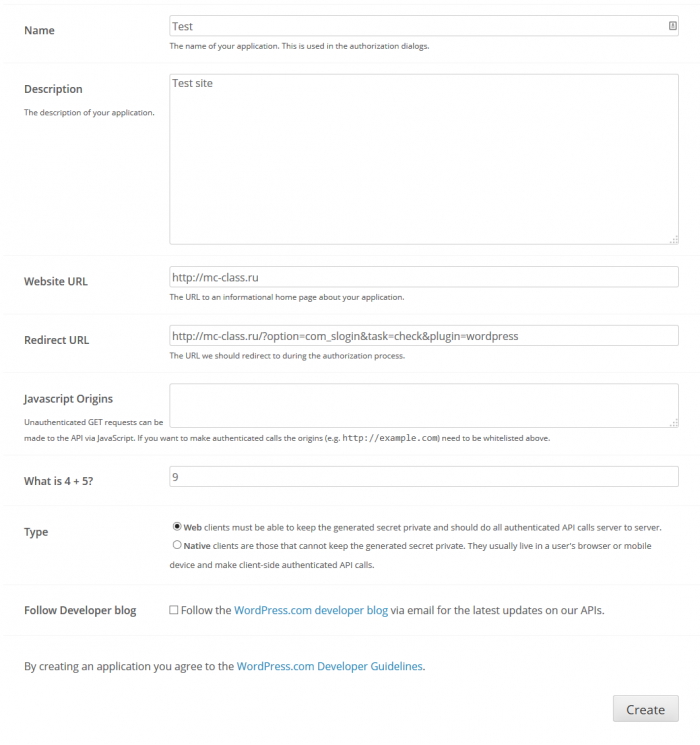 On the next page get Application ID and Secret Key and enter them in corresponding fields in component settings. 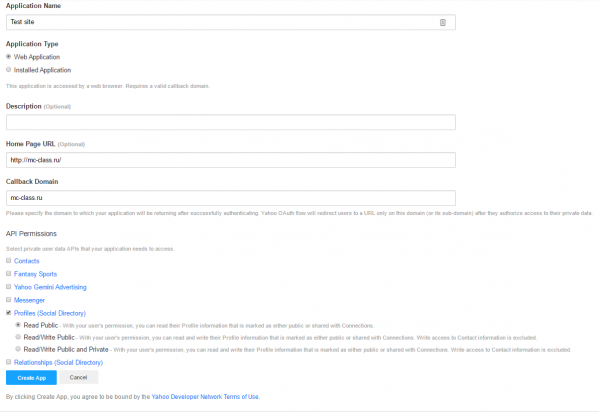 Save settings and enable VKontakte login. Beforehand it is required to set up a plug-in. Manager of extensions => Manager of plug-ins => group of plug-ins "slogin_auth" => plug-in "Social Login Google auth". Go here and create new project. Enter it's name and click "API Access" on the next page. Hit the "Create an OAuth2 client ID" button, enter name (can be the same as project) and choose "Web application" as type. Now click on "More options" link, enter your site URL and put http://mysite/?option=com_slogin&task=check&plugin=google as Callback URI. Now get Client ID and Client Secret and enter them in corresponding fields in component settings. 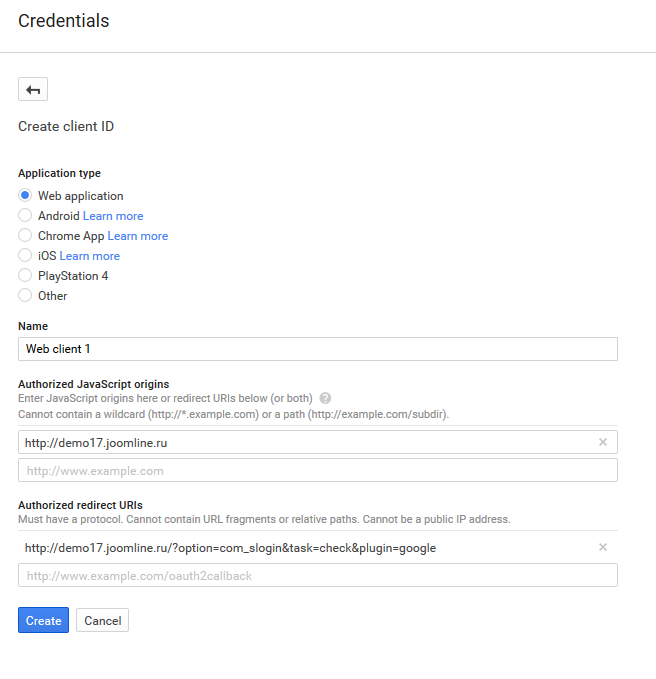 Save settings and enable Google login. 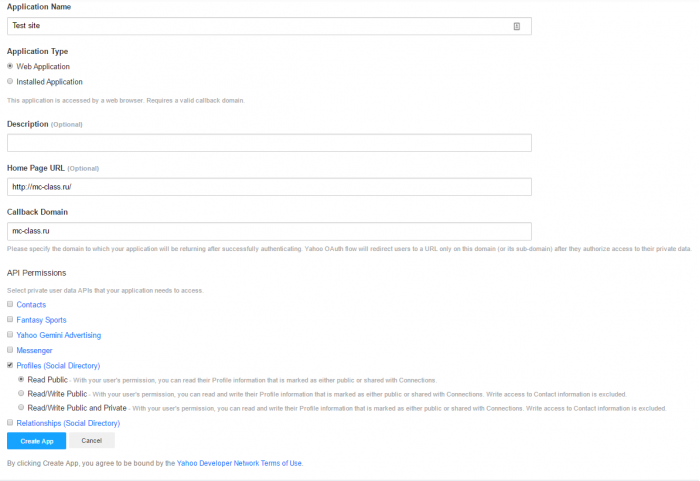 Select oAuth 2.0 client ID and its Web application. Get client_id(Client ID) and secret_key(Client Secret). Select in the "Email address" your email. Beforehand it is required to set up a plug-in. Manager of extensions => Manager of plug-ins => group of plug-ins "slogin_auth" => plug-in "Social Login Facebook auth". Go here and create new application. Click on the "my Apps" => "Add a New App". Making the settings, see screenshot. In the "Product Setup" => Facebook Login => click "Get Started". Specify site http://site.ru format. Click "Save Changes". Go to the "App Review" section. In the "Make public? ", Select "YES". Go to the section "Dashboard" and copy settings client_id (App ID) and secret_key (App Secret) in Slogin Facebook plugin. Attention! For administrator authorization application will display a message prompting you to pass moderation, do not necessarily will not be displayed to your visitors such posts as the rights that we ask Facebook does not require mandatory moderation. Beforehand it is required to set up a plug-in. Manager of extensions => Manager of plug-ins => group of plug-ins "slogin_auth" => plug-in "Social Login Twitter auth". Go here and create new applicaton. Fill only required fields and save it. On the next page click "Create my access token" button and put Callback URL - http://mysite.com/component/slogin/callback/twitter or /?option=com_slogin%26task=check%26plugin=twitter (if you are not using SEF URLs Joomla), correct the link to see the Twitter plugin field "callback URL" as Callback URL. Now take Consumer Key(API key) and Consumer Secret(API secret) and enter them in corresponding fields in component settings. Save settings and enable Twitter login. Beforehand it is required to set up a plug-in. Manager of extensions => Manager of plug-ins => group of plug-ins "slogin_auth" => plug-in "Social Login Odnoclassniki auth". Go here and register as a developer. Wait untill you request is approved, go here, fill the OAuth access form and wait again for approval email. Now go to your main Odnoklassniki Account -> Games -> My Downloaded -> Add New Application, choose Outside Odnoklassniki -> Oauth Authorization and fill the form completely (including image links!). You'll receve email shortly. Get Application ID, Public Key and Secret Key from it and enter them in corresponding fields in component settings. Save settings and enable Odnoclassniki login. Beforehand it is required to set up a plug-in. Manager of extensions => Manager of plug-ins => group of plug-ins "slogin_auth" => plug-in "Social Login mail auth". Go here and create new application. Enter name and site address and click Continue. On the next page download receiver.html file, put it to yoursite.com/receiver.html and click Continue. Now get Application ID, Private Key and Secret Key and enter them in corresponding fields in component settings. Save settings and enable Mail.ru login. Beforehand it is required to set a plug-in of authentication of Yandex. Manager of extensions => Manager of plug-ins => group of plug-ins "slogin_auth" => plug-in "Social Login Yandex auth". We select "Яндекс.Логин". We mark: Адрес электронной почты, Дата рождения, Имя пользователя, ФИО, пол. Beforehand it is required to set a plug-in of authentication of LinkedIn. Manager of extensions => Manager of plug-ins => group of plug-ins "slogin_auth" => plug-in "Social Login LinkedIn auth". Go here and create new application. Click on "Create Application". Fill all fields marked by an asterisk. Click on "Submit". We get this page. insert into the appropriate fields of a plug-in. Beforehand it is required to set a plug-in of authentication of Live. Manager of extensions => Manager of plug-ins => group of plug-ins "slogin_auth" => plug-in "Social Login Live.com auth". Save application. 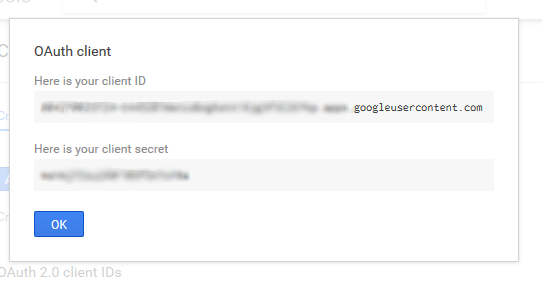 Now get Client ID and Client secret on the same page and enter them in corresponding fields in plugin settings. Save settings and enable Live.com plugin. Beforehand it is required to set a plug-in of authentication of Live. Manager of extensions => Manager of plug-ins => group of plug-ins "slogin_auth" => plug-in "Social Login Yahoo auth". Save application. Now get Application ID, Consumer Key, Consumer Secret on the same page and enter them in corresponding fields in plugin settings. Save settings and enable Yahoo plugin. Beforehand it is required to set a plug-in of authentication of Live. Manager of extensions => Manager of plug-ins => group of plug-ins "slogin_auth" => plugin "Social Login Wordpress auth". Copy Client ID field and Client Secret plug in the appropriate fields. Beforehand it is required to set a plug-in of authentication of Live. 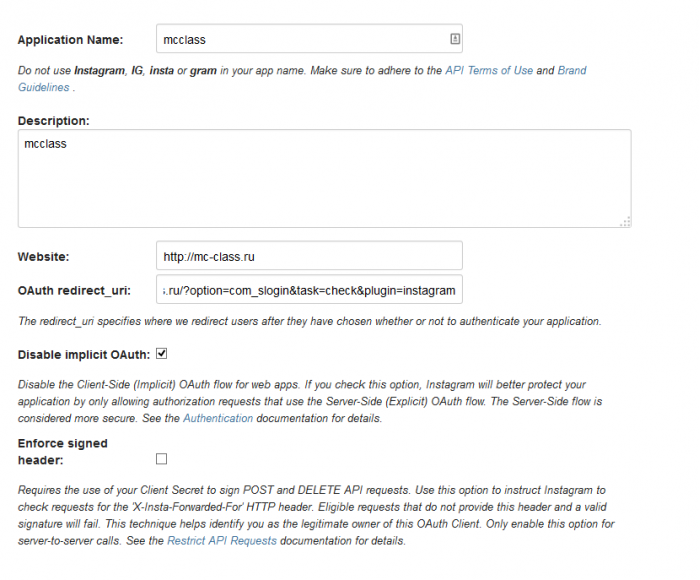 Manager of extensions => Manager of plug-ins => group of plug-ins "slogin_auth" => plugin "Social Login Instagram auth". Copy the data from the fields Client ID and Client Secret, paste the appropriate fields plugin.